Review posted January 14, 2015. First Second, New York, 2014. 158 pages. [Chu] Hing was among the first Asian Americans working in the American comic book industry. This was decades before the Asian American movement, though, so he wouldn’t have self-identified as such. Most likely, he would have just called himself Chinese. For Rural Home, Chu Hing created a World War II superhero called the Green Turtle. The Green Turtle wore a mask over his face and a cape over his shoulders. He defended China, America’s ally, against the invading Japanese army. He had no obvious superpowers, though he did seem to have a knack for avoiding bullets. So those are the facts. Here are the rumors. Supposedly, Hing wanted his character to be Chinese. Supposedly, his publisher didn’t think a Chinese superhero would sell and told Hing to make his character white. Supposedly, Hing rebelled right there on the page. Throughout the Green Turtle’s adventures, we almost never get to see his face. Most of the time, the hero has his back to us. When he does turn around, his visage is almost always obscured by something – a combatant or a shadow or even his own arm…. The Green Turtle’s face isn’t all that Hing keeps from us. Over and over, the Green Turtle’s young Chinese sidekick, Burma Boy, asks him how he came to be the Green Turtle. Every time, an emergency interrupts before the Green Turtle can give his answer. So Gene Luen Yang and Sonny Llew have stepped in and written an origin story that fits everything that appears in the short-running comic book series. 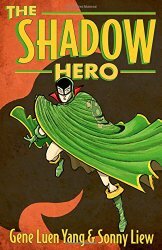 The Shadow Hero is our answer to Burma Boy’s question, our imagining of the Green Turtle’s origin story. We firmly establish him as an Asian American superhero, perhaps even the first Asian American superhero. Our Green Turtle is a shadow hero. Not only is his identity secret, so is his race…. But let me end on a fact: Studying Chu Hing’s comics, imagining what might have been going through his head, and then writing this book in response were a lot of fun – a crazy, Golden Age sort of fun. I hope reading it is, too. And that brings me to the story found in these pages – the origin story of the Green Turtle. The story is indeed tremendous fun. Hank is a Chinese boy living in San Incendio, America, with no ambitions other than to be a grocer like his father. However, his mother has ambitions for him. After she is saved by a superhero from a carjacking by a bank robber, Hank’s mother decides that he needs to be a superhero. Her methods are hilarious, including pushing him into a toxic spill and trying to get him bitten by a dog used for scientific research. Eventually, she settles for arranging for him to learn to fight. But his first efforts toward fighting for justice end up getting his father shot. However, what Hank and his mother don’t know is that a spirit from ancient China was residing with Hank’s father. Now that he is dead, the spirit – shaped like a turtle – will stay with Hank – and grant one request. This book has plenty of humor and plenty of adventure. It nicely captures the flavor of Golden Age comics. (I know a little bit about this because my son is a fan.) At the end of the book, the first Green Turtle comic is reproduced in its entirety. I like the way the source of all the details in the comic has been revealed (including our hero’s unnaturally pink skin).